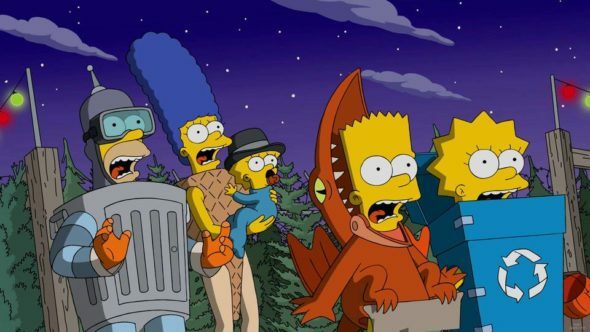 The Simpsons hit another major milestone with its Halloween episode on Sunday night. The episode marked the 600th new airing for the FOX animated series. The series is now inching closer to the record owned by Gunsmoke. That series aired 635 episodes. The Simpsons will reach that number during its 29th season if FOX renews the series. Is the series getting closer to its end though? The voice cast is signed on through a possible season 30, but the future for Homer and his family is cloudy after that. Are you a fan of The Simpsons? Do you want the series to end with season 30? Tell us what you think. I remember running in the house when my mom holler and said the simpsons was coming on the very 1st time. I have watched it ever since I hope very much that it never ends. 30 seasons Is not enough. I recognize that the cast is getting older, but voice-over isn’t THAT hard, so I sincerely hope they’ll continue. They’re great fun. Please don’t. Then we’ll be stuck with nothing but MacFarlane’s crap.